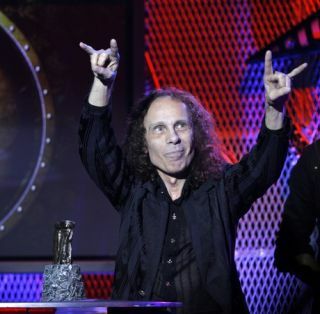 Members of the drumming community are today paying their respects to Ronnie James Dio. The Heaven and Hell frontman passed away yesterday after a battle with cancer. Shortly after the news broke, Lars Ulrich released an open letter to the former Rainbow and Black Sabbath vocalist. He said: "Ronnie, your voice impacted and empowered me, your music inspired and influenced me, and your kindness touched and moved me. Thank you." Mike Portnoy also paid his respects, saying: "Looks like Dime ['Dimebag' Darrell Abbott], Randy [Rhoads], Cliff [Burton] and Bonzo [John Bonham] just scored the ultimate singer. "This is one of the saddest days in metal ever." Megadeth's Shawn Drover also joined those paying tribute, describing his time touring with Heaven and Hell in 2007. "If you are lucky enough in your lifetime to actually meet one of your idols (let alone tour with them) and they turn out to be even nicer than you could have envisioned, that is something you would truly treasure. Lucky for me, I will cherish those memories forever."